Timeless in its regal grace, this creative expression transforms the infinity symbol into a mark of never-ending beauty. 18Kt white gold and diamonds pendant. Also available in 18Kt yellow gold. Tahia logo Tahitian pearl multi-colored silk ribbon bracelets. Also available with an engraved mother of pearl. They can be worn as a bracelet or a choker necklace and can adapt to your casual wear just as much as your evening dresses. Earrings and necklace in 18 karats white gold and diamonds. “Radiance Fantasy” is a timeless collection and of whose design brings a contemporary touch. The “Coils of Eternity” are Tahitian pearl earrings in 18 karats white gold. They represent the promise of an endless love. Also available in 18 karats yellow gold. Pendant, earrings and omega chain in 18 karats white gold and diamonds. Also available in 18 karats yellow gold. The “Queen of Joy” is an emblematic TAHIA design. 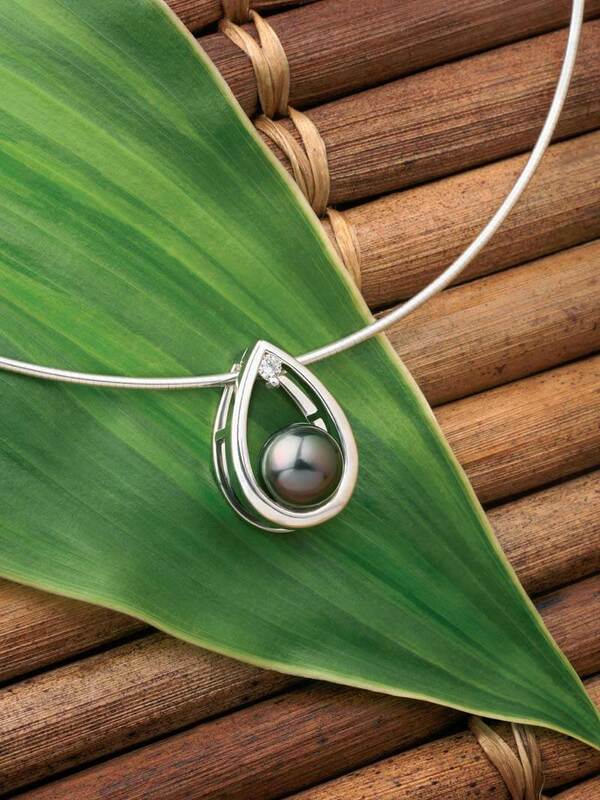 It is the essence of finesse and harmony between the precious Tahitian pearl and baguette-cut diamonds. Tahitian pearl necklace and earrings in 18 karats white gold and diamonds. Love is a precious vertue. It is the evidence of a deep affection. This unique design embodies love and passion, a relationship pearls and diamonds have by nature. The pearls with multiple colors are strung together and bound by diamond separators. XO is the tenderness of a passionate kiss. 18 karats white gold and diamonds set. “Pearls & Diamonds Sparkle” is a collection that sublimates the various colors of Tahitian Pearl with precious diamonds. Tahitian Pearl necklace in 18 karats white gold, pink sapphires and diamonds. Brings freshness and delicateness to your outfits. Also available in blue or yellow sapphires or simply in diamonds. 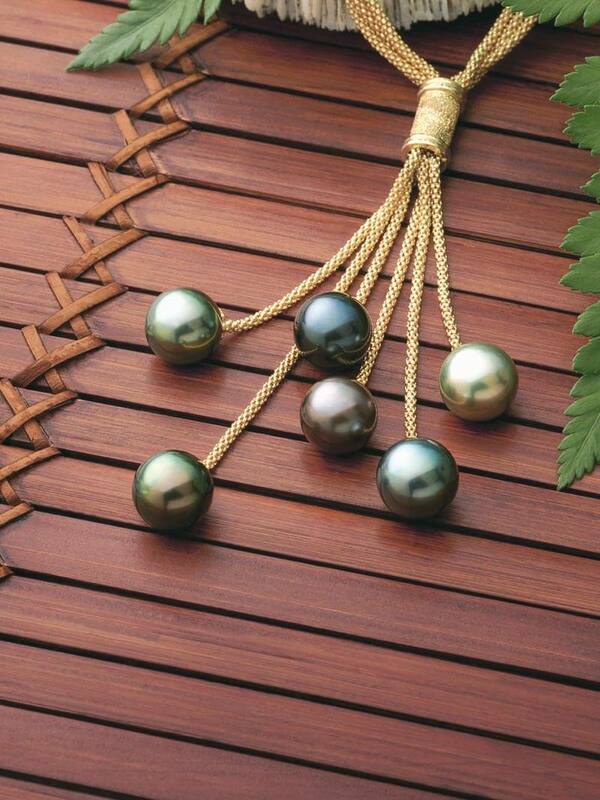 Tahitian pearl necklace and earrings in 18 karats yellow gold and diamonds. The “Morning Mist” collection is a reminder of the natural beauty of things. Combining a thought towards the local flora and our precious marine ressources, this set will enhance your outfits. The pearls are highlighted by the yellow gold and the diamonds in a unique and remarkable fashion. 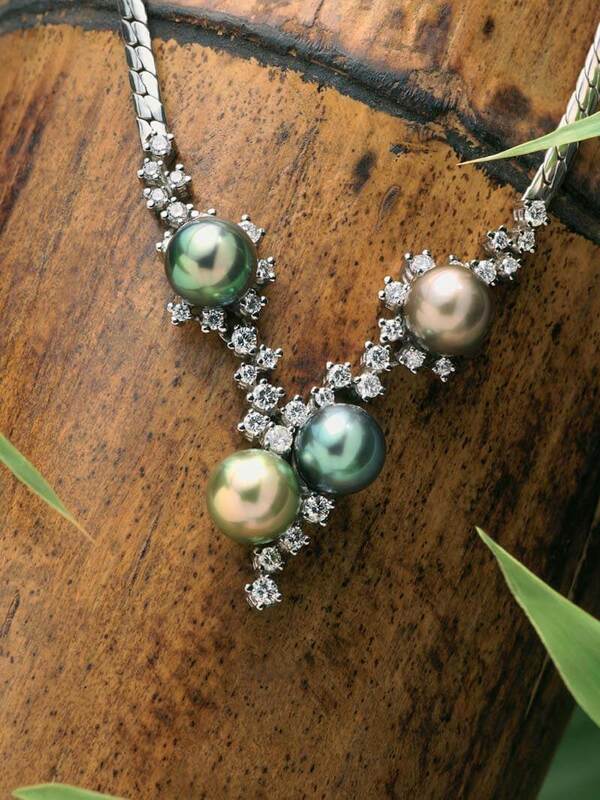 “New Moon Under a Choral of Stars”: Tahitian Pearl necklace in 18 karats white gold and diamonds. 1st Prize winner of the 5th Tahitian Pearl Trophy. Pure , elegant and unique design by Tahia. Tahia’s “coup de coeur” rings collection. Tahitian Pearl rings in 18 karats white, rose or yellow gold with diamonds. The light effects reveal the natural beauty of things around us and plays on the delicate mariage of pearls & diamonds. The subtlety of the diamonds that embrace the pearl on each ring makes for a delicate and fine design. 18 karats yellow gold and diamonds bangle bracelet. “Supreme Desire” is a fine jewelry piece and a tribute to the Tahitian pearl in its pure state in a fine jewelry piece. “Graceful” collection sautoir necklace set in 18 karats white and yellow gold. 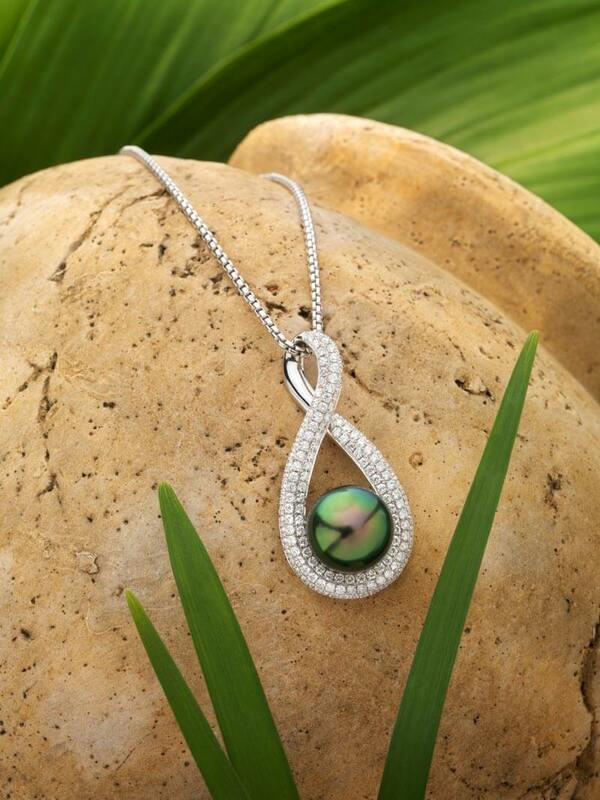 This elegant necklace is a play on colors and geometrical shapes that highlight the Tahitian Pearl.